Hello friends! Sorry I disappeared for a few weeks...strep throat hit three out of the four of us in our house and even when we thought we were over it, it came back to bite us again! It's been a long few weeks, but I think (fingers crossed!) we are finally over it! 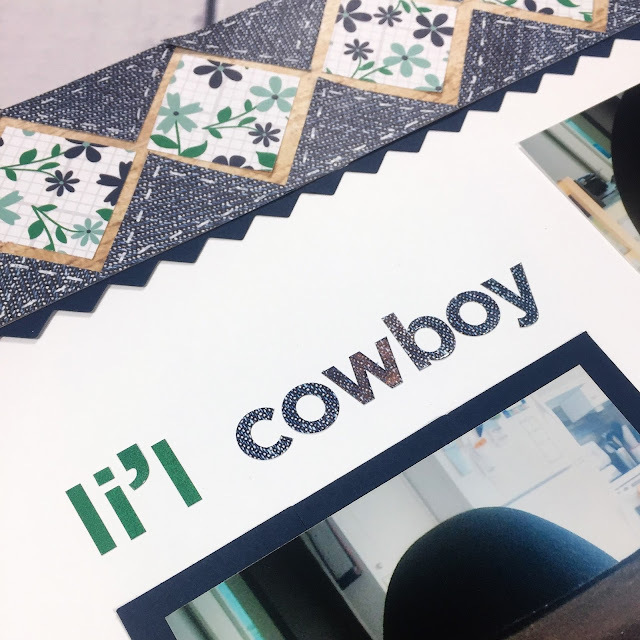 Today I'm sharing a border design over on the Creative Life Scrapbooking FB page. 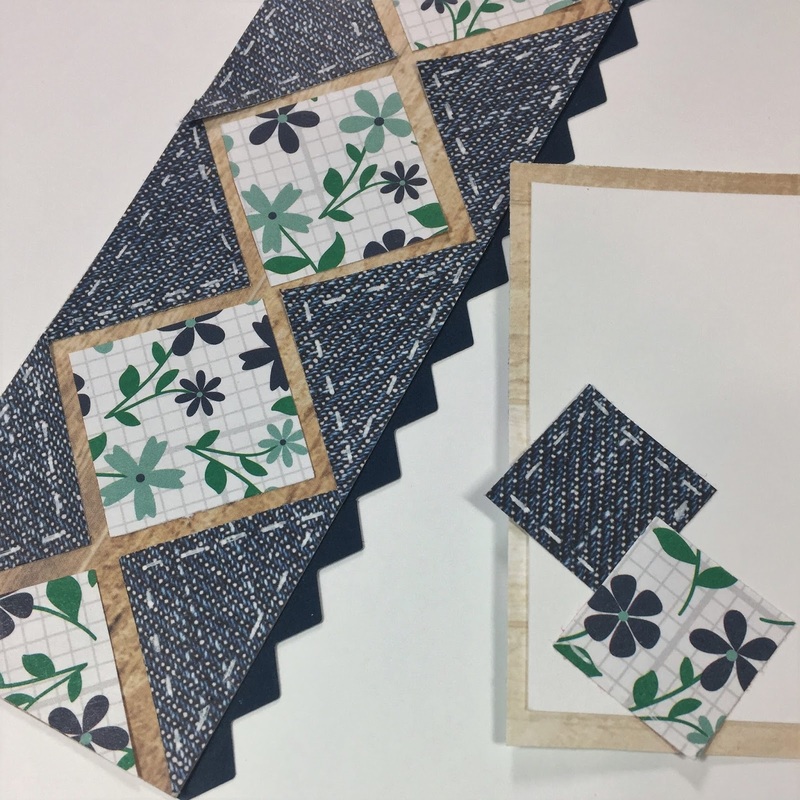 Every Monday we feature Border Maker Monday, and on Friday's we have Feature Project Fridays! If you haven't already "liked" our page, make sure to head on over there and join us so you can see what we're up to! I have to say that I was a bit worried about my turn at Border Maker Monday! Most of you know that borders are not my go-to, but I like to use borders as part of a larger page design. I know from all the gorgeous pages out there that sometimes a beautiful border can be enough! 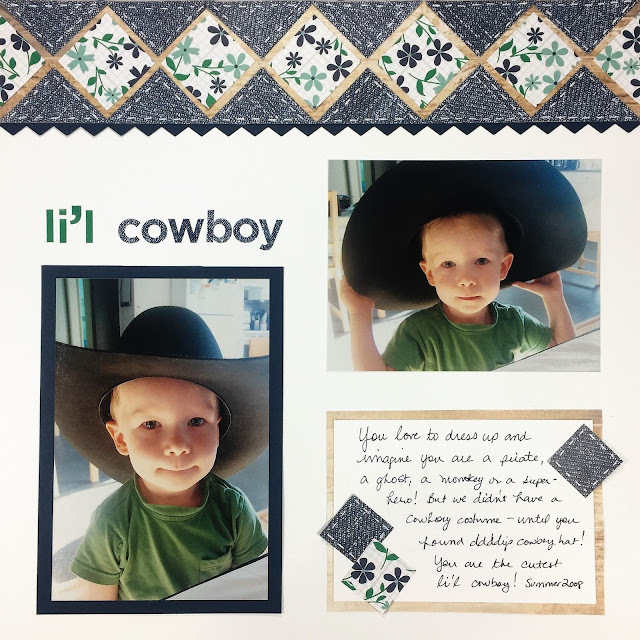 I had an idea that I wanted to create an old-fashioned quilted border to highlight a couple of photos of my young son dressing up in his dad's cowboy hat. I wanted it to be pretty and sort of western feeling, but it couldn't be too girl-ish. So, I pulled some scrap strips of some of my favorite papers that echoed the colors in the photos – a medium denim from Creative Memories Denim Blues paper pack, the green, turquoise and navy mini-floral print from the A Year to Remember 2 paper pack and the woodgrain paper from the Hello Baby Boy paper pack. I also found a strip of some treasured CM Navy cardstock from a loooong time ago! PS...All these products (with the exception of the Gel pen and retired navy cardstock) are available for purchase on my Creative Memories website, but I do want to mention that the A Year to Remember 2 and Hello Baby Boy paper packs are now WSL, so if you like the look of them, don't wait! I ran one edge of the navy cardstock through CM’s Border Maker using the Picket Fence cartridge that comes with the system, and adhered the woodgrain strip (which measures 2.25" x 12") on top so that just the points of the fence were peeking out. I cut a 1.5” x 12” strip from the denim paper and then cut it into six 1.5” squares. Then, I created 12 triangles by cutting each square from one corner to the other with my scissors. I placed the long side of each triangle along the edge of the woodgrain strip, slightly overlapping to fit, and adhered them down. Next I cut a 1.25” x 12” strip from the floral paper and cut it into six 1.25” x 1.25” squares (there was a bit some leftover). I cut one of the squares into triangles and left five squares whole. I adhered each of the squares in between the denim triangles and placed the triangles at the top and bottom of the border strip. Finally, I used a white Gel pen (Sakura brand) to add faux stitching lines along the denim to give it a quilted look. To create the journal box, I used a 5" x 3.25" piece of the woodgrain paper and adhered a 4.75" x 3.5" piece of white cardstock on top. 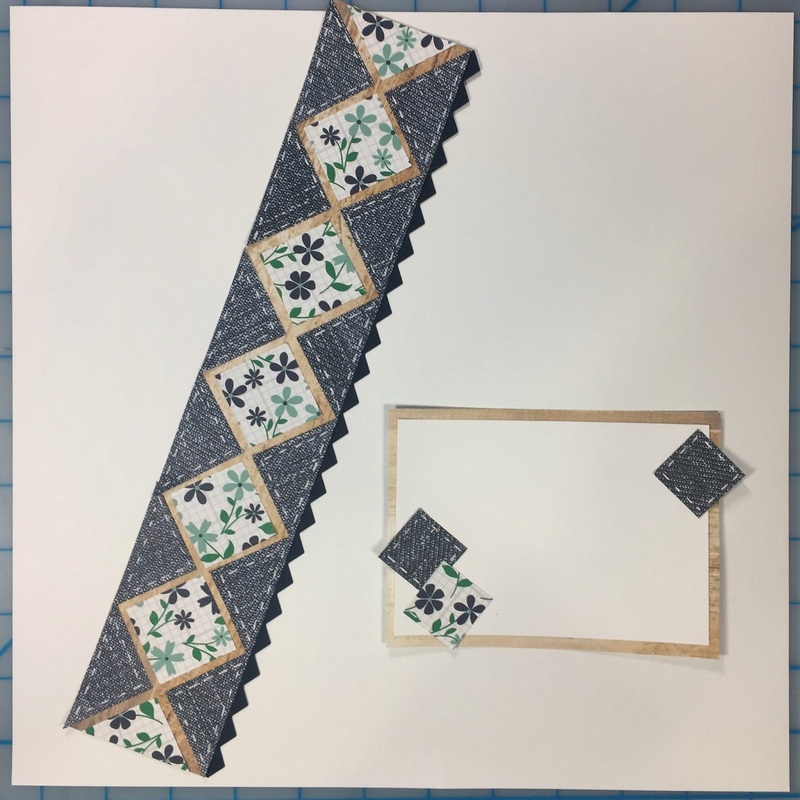 I added a few 1” squares of the denim and floral papers to coordinate with the papers on the border strip. Do you create borders or are you a full page kind of scrapper? I encourage you to give borders a fresh look...sometimes they ARE enough! PS...Don't forget to leave a comment on the March 1-2-3 Card Post or under the YouTube video (or both!) by next Friday March 31st for a chance to win the card kit! Good luck!